We hear a lot of people talking about the 2.0 world we live in. Marketers refer to social media tools as Web 2.0. The titles of business books increasingly contain that magical number—2.0. But what does “2.0” mean? How are things different now than they were before? What has changed? For starters, let’s agree that the social media revolution has created an entirely new landscape—a 2.0 world. The changes are so profound that those who do not understand it will soon find themselves on the sidelines, confused and perhaps even angry that the world has passed them by. Let’s look at the nuances between the two. Audience vs. Community. What’s the difference between an audience and a community? The direction the chairs are facing. A community is much more connected and interactive than is an audience. Broadcast vs. Conversation. A broadcast pushes information outward from a centralized communications hub. Conversations, on the other hand, rely on user-generated content. The best conversations are those that are decentralized. They tap into the collective wisdom of all the participants. Traditional vs. Social Media. Traditionally, information was broadcast from a central hub to an attentive audience. In a 1.0 world, the major media were newspapers, radio and television. Today, in the new 2.0 world, communities have decentralized conversations among themselves. They share user-generated content on Facebook, in blogs, through Twitter, on YouTube and via an endless variety of social media. Fireworks come from a centralized source. A fireworks show is designed to dazzle an adoring audience. The role of the audience is to watch and be impressed. A campfire, on the other hand, represents a warm, inviting place where people gather to tell stories, sing songs, swap jokes, share family photos and talk about various topics of mutual interest. The content of campfire conversations is user-generated. Fortunately, there is a place for both fireworks and campfires. They don’t have to be mutually exclusive. Traditional and social media will coexist and actually complement each other. Those who prosper and succeed in the 2.0 world will be those who understand that it’s all about having conversations within communities. With that in mind, I’d love to have you join me here around the campfire as we have a cup of hot coffee and reminisce about “the good old days” when we once lived in the less-colorful 1.0 world. Welcome to our new 2.0 reality. This entry was posted on Wednesday, February 17th, 2010 at 5:30 am and is filed under Marketing Oneself. You can follow any responses to this entry through the RSS 2.0 feed. You can leave a response, or trackback from your own site. 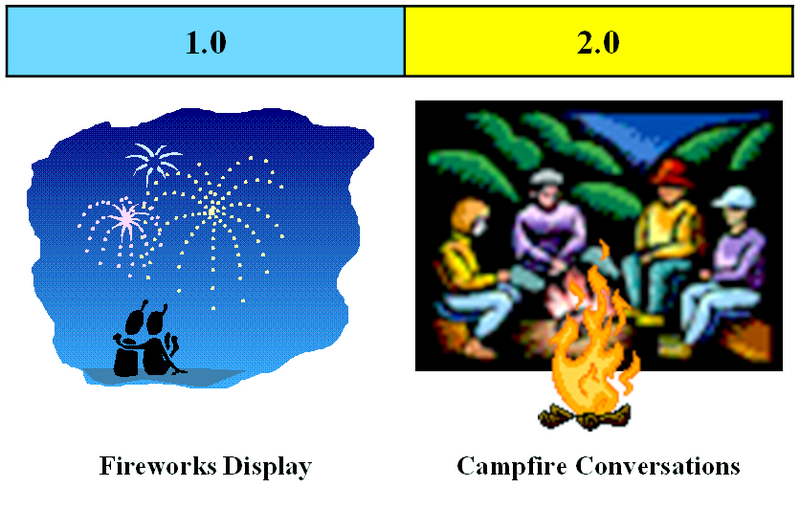 I never tire of the fireworks versus campfire analogy. It just works so well! Thanks Duane! seriously, your simplification made more sense to me than any other definition of 2.0. Excellent, crisp definition and comparison. Couldn’t be any better. Thanks, Hassaan, for your comment. From your LinkedIn profile, I see you’re from Pakistan. I love the way technology and social media can shrink our world and help us all to realize the commonalities we share in our human journey here on earth.